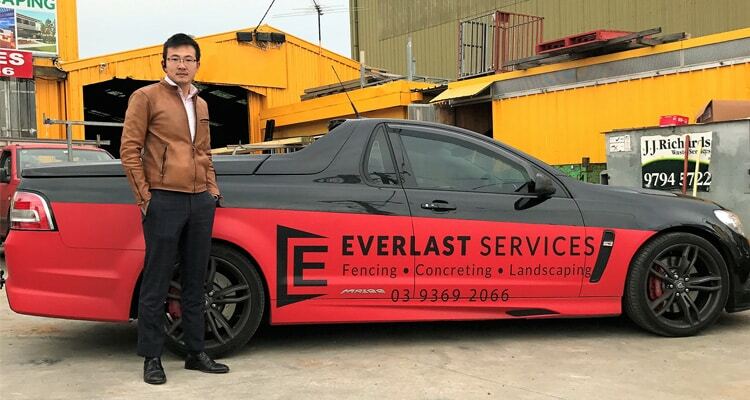 Everlast Services Melbourne is a proudly family owned and operated fencing, landscaping and concreting business located in Hoppers Crossing. We manufacture all our own steel products at our state-of-the-art factory in the western suburbs of Melbourne. As such, we stand behind the quality of all of the products we use 100%. Plus, all of our materials are completely Australian made and owned. With more than 20 years in the business, we know all there is to know about all types of fencing, landscaping and concreting. Let us apply our knowledge to your next home improvement project for a result that is sure to delight. While we have a highly talented and experienced team of fencing, landscaping and concreting contractors, we are also a steel fabricator and wholesaler. So, if you’d rather install your fence or complete your backyard renovation yourself, then we can supply high-quality, affordable materials (without the pesky middleman taking his cut). We deliver anywhere in Australia. No job is too big (or too small) for us. Aluminium Slat Fencing: this type has a lot to offer, including the latest in style. The clean, modern lines of aluminium slat fencing will enhance the appearance of your home, commercial property, or industrial property. Steel Fencing: without a doubt, this has become one of the ultimate all-round materials. Its strong, tough, durable and built to last. Best of all, we can custom design and supply any type of steel fence panels at our factory in Hoppers Crossing. Swimming Pool Fencing: when it comes to the safety of your family, can you really take any chances? The team at Everlast will ensure that your swimming pool fence is in line with all safety codes, and that it’s built tough and looks great. Industrial Security Fencing: Everlast are experts in industrial security fencing. Regardless of whether you need to protect your home, office or factory from thieves or vandals, our security fencing guarantees utmost protection. Colorbond Fencing: this durable building material was designed specifically for the harsh extremes of Australia’s climate. With a stylish Colorbond fence designed and installed by Everlast, you can rest assured that your fence will still be standing years in the future. Driveway Gates and Fences: not only are we experts when it comes to fences, we also have the expertise and expertise to complete the entire package, designing and installing super quality driveway gates and side fences. Our gates and side fences will fulfil all your security and privacy demands, and look good as well. Steel Supplies: apart from being expert fencing contractors, we also have a wide range of steel fabrication services, selling all our products wholesale to the public. We supply high-quality steel and metal products direct to you. This completely eradicates the middleman, and makes your job much cheaper. Fencing Supplies: with our expert steel fabrication skills, there’s no need to look any further when it comes to your fencing supplies. We can supply anything you need, from locks and screws to hinges and mailboxes. Aluminium Fence Panels: our aluminium panelling doesn’t rust, fade or crack. It really is one of the most durable products around. Not only that, we sell wholsesale, direct to the public. This cuts out the middleman and makes our panels much more affordable. Concrete Driveways: Concrete driveways will add value to your house. So, why not use Everlast to give your house a durable, cost-effective, clean and stylish entry point. Exposed Aggregate Concrete: If you want to add a spectacular visual element to your concreted area, then you can’t go wrong with exposed aggregate concrete. This product is even perfect for outdoor areas, particularly pools, with it’s non-slip surface. Painted Concrete: Painted concrete gives you the variety you need to create an outdoor space that enhances the entire aesthetic of your home. It’s simple, elegant, and if poured by Everlast, will last for years to come. Landscaping Design: With over 20 years experience, our landscape design experts will make your backyard dreams a reality. With our attention to detail, we will create a landscape design that is completely unique, whether you have a small courtyard or a 10 acre block. Landscaping Solutions and Installation: Our team has all the skills and experience to install all your landscaping needs, from drainage and planting, right through to constructing decks and pergolas. Landscape Supplies: If you’ve decided to take care of your own landscaping, then Everlast is the perfect place to get all the landscaping supplies you’ll ever need. Timber Decking: our timber decking quickly and easily extends the living area of your home, providing the perfect vantage point from which to enjoy your backyard or next BBQ. Pergolas: we can design and build steel framed pergolas with a whole range of roof profiles, from gable and skillion, to curved or custom designed structures. All our pergola designs are tailored to suits not only your needs, but your back pocket as well. We also service a whole range of other areas and suburbs, right across Melbourne. We have installed fences and delivered top-notch landscaping and concreting jobs in some of Melbourne’s eastern suburbs such as Box Hill and Templestowe, in bay-side suburbs like Bentleigh and Mentone, and even as far as Dandenong and Geelong. Regardless of your location, if you have a home improvement job that you need done, we’re more than happy to help.